CANTON, Mass. (June 30, 2011) – Over 80,000 ice cream enthusiasts recently voted in “The Big Thaw,” an online survey to determine which classic Baskin-Robbins flavor fans wanted to bring back. 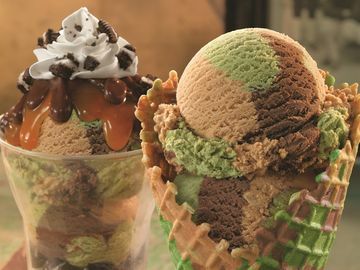 Winning by a landslide, with 70% of the vote, Pistachio Almond Fudge is a Baskin-Robbins favorite from 1967 featuring pistachio ice cream with a chocolate ribbon and fudge covered almond pieces. This unique flavor will bring ice cream fanatics back five decades to when LBJ was president, a certain band from Liverpool was making a name for themselves stateside, the first ATM was introduced, and miniskirts came into popularity. “We were impressed with the number of fans who cast their votes to bring their favorite flavors out of the ‘Deep Freeze,” said Brian O’Mara, Baskin-Robbins, Vice President of Marketing. The Baskin-Robbins flavor library currently holds more than 1,000 notable flavors. As ice cream trends change to reflect consumers’ craving for new ingredients, flavors are retired to make room for new creations. With more than 6,400 locations around the globe, Baskin-Robbins continues to deliver delicious ice cream flavors that ice cream lovers enjoy worldwide. To learn more about the Baskin-Robbins “Big Thaw” survey, consumers can visit the Baskin-Robbins Facebook page at www.facebook.com/BaskinRobbins or follow Baskin-Robbins on Twitter at www.twitter.com/BaskinRobbins.